Stephen Fries is now in residence at the kitchen of the Three Compasses in Dalston Lane, E8, serving up famously great burgers and more. 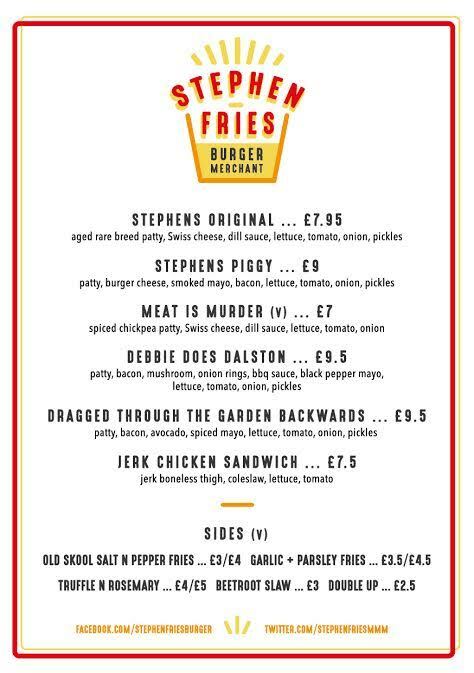 The burgers have names like Debbie Does Dalston, Dragged Through The Garden Backwards, and Meat is Murder, a vegetarian option made from chickpeas. Stephen Fries will serve Monday-Saturday, with Papa Dez's Sunday Roast on the Sunday. "We are pleased as punch to announce the return of Stephen Fries - Burger Merchant to the Three Compasses, after overwhelming public demand. Please do let me know if you'd like to come down and try his delicious menu. Stephen Fries, AKA Michael Brown, is one of the very first kitchen residencies to be hosted by The Three Compasses four years ago. Customers still talk about his legendary burgers to this day, so we decided to hunt him down and demand his return! Notable achievements of his previous residency include the Debby Does Dalston (a glutinous feast of a burger garnished with home made onion rings, bacon and BBQ sauce), and his infamous Horse Meat Burger, making national headlines after being put on the menu at the height of the contaminated meat scandal to highlight the fact that horse meat when sourced properly, is actually a delicacy enjoyed all over Europe. 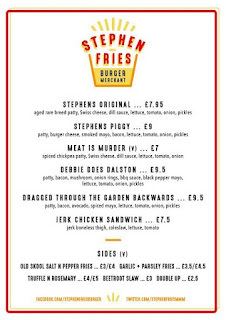 Stephen Fries is serving burgers as of this week, Mon-Sat, with Sundays handed over to the capable hands of Papa Dez for his famous Sunday Roast (previously at The Kenton, and prossibly the best roast in Hackney)."